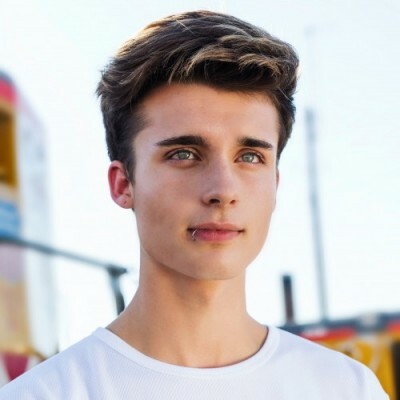 Speaking with vlogger and musician Chris Collins, a.k.a @WeeklyChris, via video chat, we found him to be charismatic and down to earth. As fellow Canadians, we talked about the cold winter weather and he gave us a glimpse of the sunny California weather outside his window. When did life get so crazy for the 19-year-old and how did Chris become the Internet sensation that he is today? He started out as a shy kid who just loved spending time on his computer. Creating videos was something he did just for fun. “I used to take my mom’s pink video camera and film videos, and then I would post them on YouTube.” Chris wasn’t expecting anyone to watch them, but little did he know that these videos would start garnering over 100,000 views each. Soon, he became a social media star, and fans began to want more. Not only is Christian a YouTuber, he is an online global influencer with fans all across the world. His social media spans seven different platforms and tallies over 20 million followers across Facebook, Vine, Instagram, YouTube, Twitter, Snapchat, and Musical.ly. In addition to creating videos, Chris is also making waves with his music. With his original single You Don’t Have to Go becoming a big hit, Chris is spending this year focusing on finishing his much anticipated debut album. Like many other people, Chris admits he tends to overthink things when working on a project. “There’s a lot of stuff, especially within the lyrics that I’ll go over sometimes. It’s random things that a lot of people won’t catch but I’ll overthink it and fix it just for me.” With this album he explained that much of the content will reflect his experiences and everything he was going through at the time. On Chris’s upcoming album, fans may even hear some collaborations with other Youtubers who are also pursuing music. He didn’t reveal any names, but Chris did say there are definitely spots for features from other artists and that he has some people in mind. Looks like we’ll have to wait and see exactly who those artists are! It may seem like all is perfect for this internet sensation and musician, however, Chris has had a few bumps in the road. He mentioned that last year was a discovery process for him and that he’s still learning. One of the biggest struggles he faced in 2015 was dealing with other people’s opinions. He found himself constantly worrying about what people thought and whether they were going to like his work. He overcame this challenge by realizing that it’s okay to value other people’s opinions, the key is to not base your self worth on them.